…Not to be confused with apple, banana & pepper jelly. Eww. 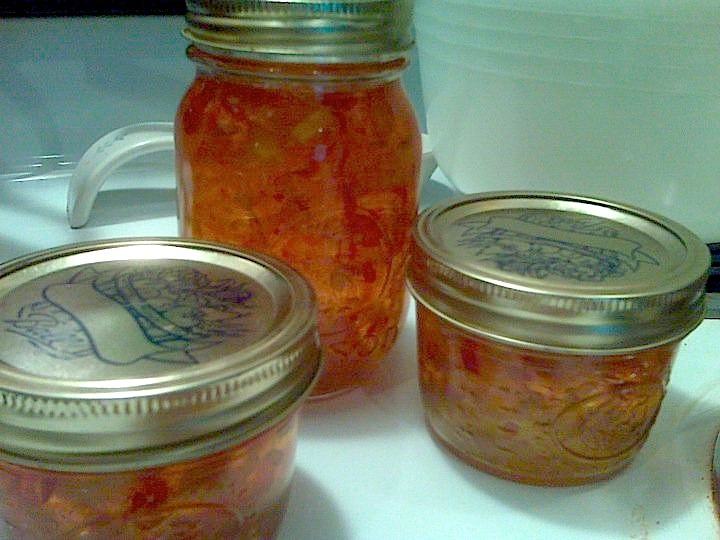 This jelly uses Banana Peppers that my mother has grown in her garden since I was little. They’re delicious and come in either sweet or hot. I like to use the hot peppers because it gives this sweet jelly a little kick and the apple adds a wonderful sweet-tartness to it. I can this jelly in the summer when the peppers are in season then my husband and I give it away as Christmas gifts later in the year. As most of you know, pepper jelly is an excellent thing to pair with cream cheese either on crackers as a simple party appetizer or I love to spread it over my cream cheesed bagel all throughout the year. Enjoy! –Cut peppers in half, remove all seeds and veins. Core the apple, leaving the skin on and cut in small pieces. Place pepper and apple pieces in blender with 3/4 cup of vinegar and blend until finely chopped, but not mushy. You want little pieces to remain so the jelly has good texture. –Pour pepper mixture into a large pot and bring to a boil. Boil 2-3 minutes until it begins to smoothen out a bit. –Add the remaining 3/4 cup of vinegar and the 5 cups of sugar. Stir. Bring to boil and cook for 1 minute. –Add the package of pectin. Bring back to boil. Cook for 1 minute. –Turn the heat off and skim any foam from the top of the pot. Let the pot sit for 5 minutes. –Fill your sterilized canning jars almost to the top and follow the package instructions for safe and effective canning.